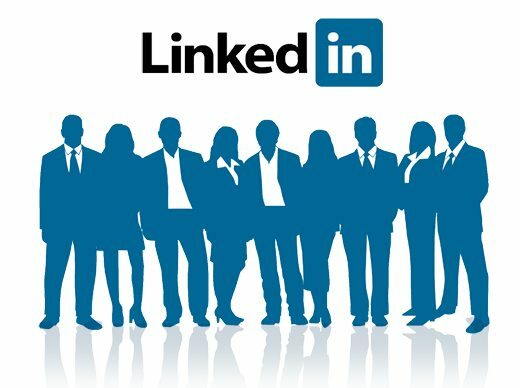 Every second, more than two new members sign up for LinkedIn – joining nearly 500 million members in over 200 countries and territories. With audience numbers like these, it’s no wonder salespersons look to the biggest professional network in the world to search for the perfect lead, follow up with contacts and carry out a number of different strategies to win accounts. Not all tactics are created equal, of course, as a sales rep can easily turn a hot lead cold or a cold lead hot depending on the steps they take to “sell” on LinkedIn. Let’s look at some of our top tips for using the network to create and close leads. We all know the better prepared you are, the higher your chances are at succeeding in life, and in social selling it’s no different. 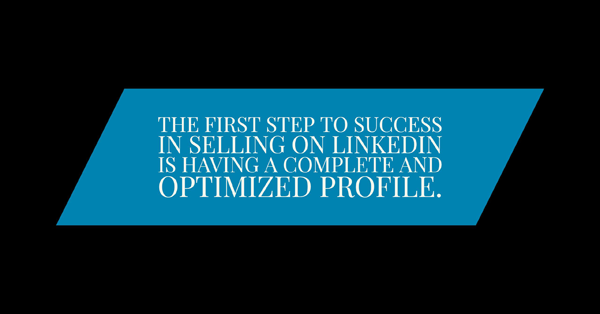 The first step to success in selling on Linkedin is having a complete and optimized profile. When crafting this profile, it’s critical to keep in mind the type of prospects you are trying to attract. This will allow you to craft targeted messaging that appeals to your specific audience, which will help ensure a positive, buyer-centric first impression. Fortunately, there are many sites that offer insight on how to optimize a profile and ultimately get more views. For example, to get more profile views, there are a handful of actions you can take, like follow certain people or join specific new groups. Having a solid connection base and a complete profile will provide the appropriate foundation to establish yourself as a selling authority. Not everyone can be an award-winning author, but it’s important to acknowledge the fact that effective social selling requires high-quality content. As unique and compelling content becomes increasingly important in growth and differentiation, strong writing skills and the ability to generate unique content are driving forces behind sales. The key behind creating content is focusing on one area of expertise and topics you are knowledgeable about to offer practical and actionable information for your audience. Linkedin and Medium are two incredibly effective platforms for this type of communication geared to tailored audiences. Additionally, crafting compelling headlines that have the ability to capture the readers’ attention is critical. An intriguing headlined followed by great content – not matter how long or short – can reap amazing benefits. For example, I recently attended a panel on women and inside sales, and following the conference I posted my takeaways in a blog post on Linkedin. While this write-up only took me 30 minutes to complete, it led to 2,500 views, 123 new Linkedin connections and helped create two new opportunities, one of which led to a closed deal. Being perceived an expert in your market is tremendously valuable in social selling and producing content that has the capacity to resonate with customers is a great way to establish credibility. In order to get people interested in you, oftentimes you have to indicate interest in them first. This is where becoming a “groupie” becomes relevant for sales. Just as to being a groupie of your favorite band increases your chances of actually meeting them, joining and participating in relevant groups on LinkedIn increases your chances of generating leads and insights into your buyers. I recently joined a group called “Sales Hacker” to discuss a recent email trend I saw occurring. Following the question I posed in the thread, I received 12 comments in just a few short days and the discussion itself ended up being great way to meet and engage with like-minded people. My advice right now would be to review relevant groups on LinkedIn and request to join. After gaining entrance, take time establish yourself as an active member by post engaging content and participating in discussions. This will help establish yourself as a source and an industry leader worth following. LUV stands for Leave Unsolicited Validation. 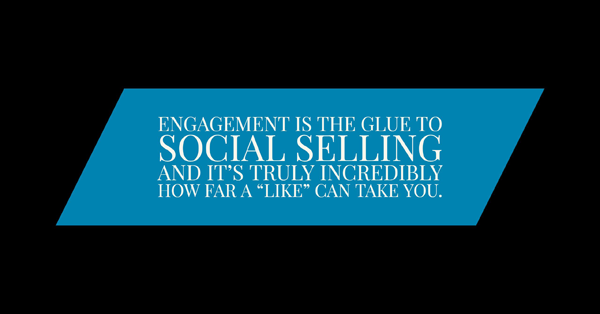 Engagement is the glue to social selling and it’s truly incredibly how far a “like” can take you. I recently found a prospect I wanted to connect with so I began by liking pieces of their content – posts, shares, etc. Shortly after, this prospect began liking my posts as well and in no time we began a dialogue that resulted in a meaningful, professional relationship. There are multiple ways to spread the LUV on LinkedIn with mentions, likes, shares, comments, recommendations, endorsements and follows. Find the option that works for you and begin practicing with interesting prospects that you believe may lead to successful sales deals or network relationships. Feel free to start with more subtle methods and then move to actions like commenting. Additionally, always remember to ensure your comments have a degree of value behind them — great comments are thought provoking and include questions for engagement and conversation. These interactions will put you on the map, provide brand visibility and lead to more connections. Gabe Larsen has over 15 years of experience in driving business revenue for companies of all sizes. As Director of InsideSales.com’s Labs, Gabe has helped over 200 clients solve the biggest problems in the Sales Acceleration space.